Hello, and Happy New Year’s Eve! I’m looking forward to 2014. Also, happy seventh day of Christmas! My family has always celebrated all twelve, beginning on Christmas Day. This year, I spent about a month painting an Advent calendar which honors that. Though other Phoradendron species do grow in conifers, P. leucarpum prefers hardwoods, making this painting a little inaccurate! 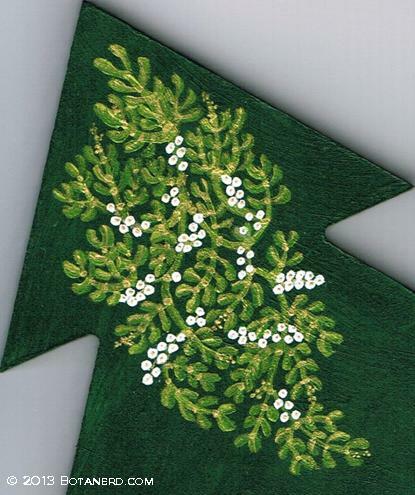 One of its common names is Oak Mistletoe, but it grows in many other kinds of hardwoods as well, including maples. Phoradendron mistletoes may resemble, but are a different genus from the traditional European one, which is in genus Viscum. Both used to be classed in their own family, the Viscaceae, but genetic evidence suggests that they both belong in the Santalaceae family, along with the sandalwoods, genus Santalum. Interestingly, sandalwoods, like mistletoes, are also hemiparasitic! Instead of parasitizing tree limbs like mistletoes do, sandalwoods parasitize the roots of neighboring trees. One species, the desert quandong of Australia, can stretch its roots over thirty feet to reach host plants! Like the European mistletoe, Phoradendron leucarpum is dioecious, with separate male and female plants. 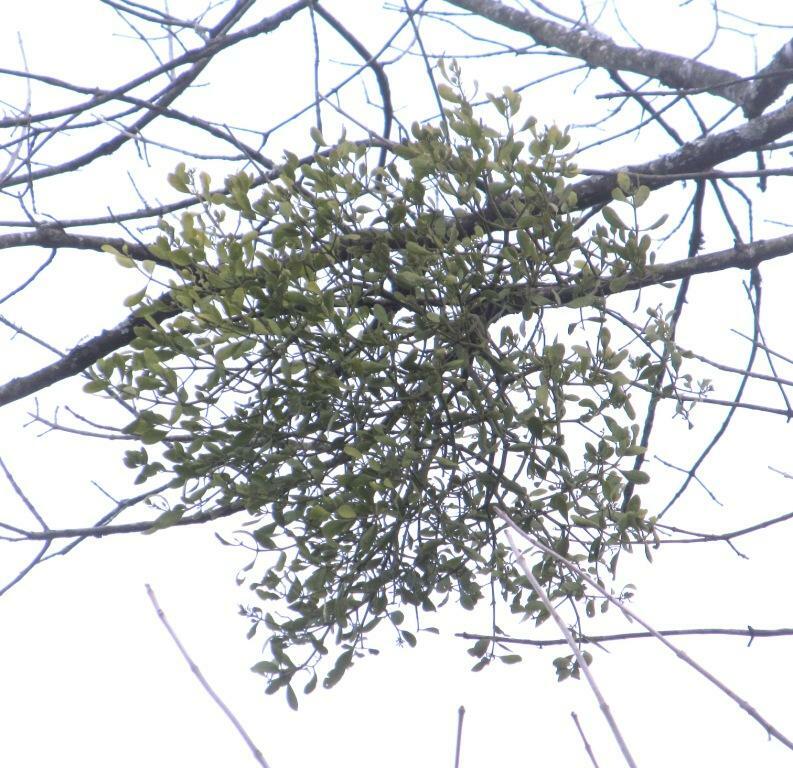 Though we have plenty of mistletoe around here, I have never seen any berries. I’m not sure how likely it is that they’re all male, though; I’ll just have to look harder! It looks graceful and delicate way up there, but those leaves and stems are surprisingly large. I was amazed when the wind blew some down this year and I was able to pick it up. The leaves were at least two inches long, and as thick as those of some succulent plants. Maybe that’s an adaptation to staying evergreen high up in the wind, unprotected by the host plant’s leaves, and having to steal all your water even when sap isn’t as plentiful? For years, I wondered what the Cherokee people were referring to by “Snowbird.” There are the Snowbird Cherokee, Snowbird Mountains, and the word “snowbird” in my Cherokee dictionary doesn’t split into words for “snow” and “bird”, so I knew it had to be something unique. I eventually found out that the snowbird is the junco! This makes sense, as they winter here, feed on the ground even in snow, and their bellies are white. As they spend their summers in Canada, this certainly gives new meaning to also referring to Canadian warm-weather tourists as Snowbirds! 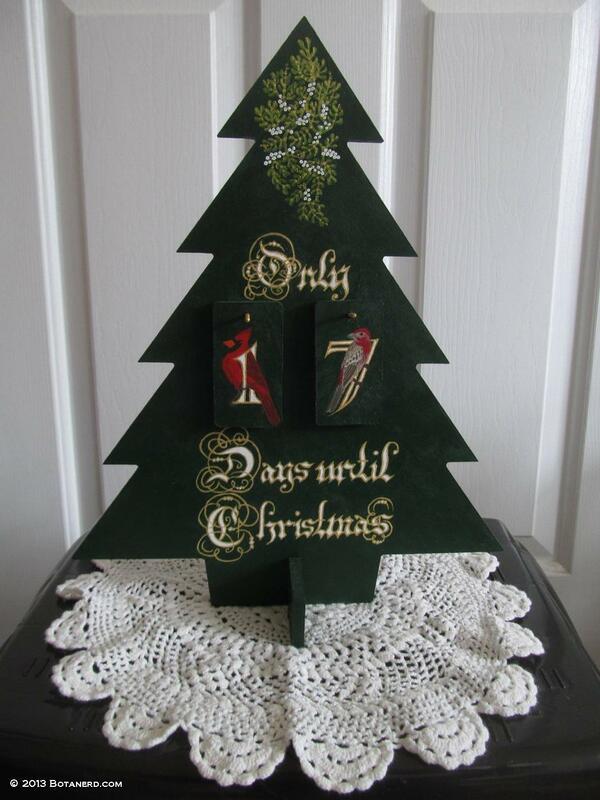 And on the back, I made it possible to keep track of the 12 Days of Christmas, ending January 6! 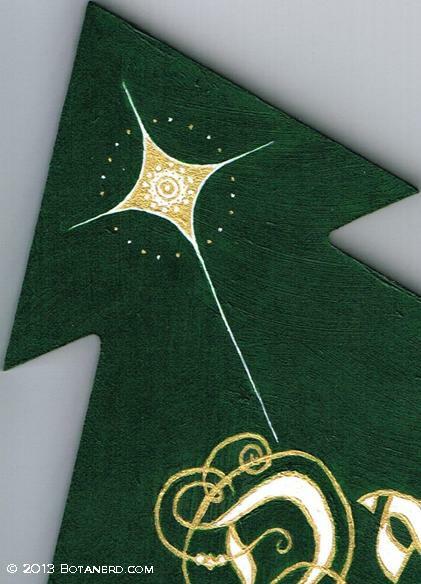 As stars don’t naturally occur in fir trees, either, I think I’m good! 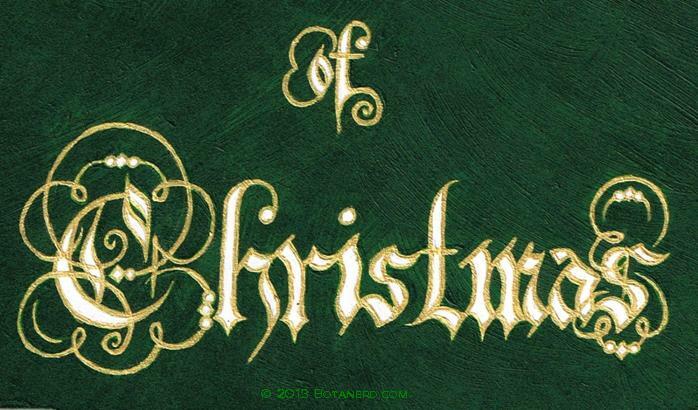 While the numbers were based on the Colonna MT font, I based the lettering on Parchment font with a few subtle changes. So, what kinds of birds are in your area over the winter? If you’d like to broaden your awareness, you might be interested in the Great Backyard Bird Count. Participants record every bird in their yard between February 14 and 17. I did this one year in high school and had a lot of fun with it, becoming much more conscious of the variety and number of birds surrounding me. This entry was posted in Birds, Phoradendron, Santalaceae, Santalales, Santalum, Uncategorized. Bookmark the permalink. What a beautiful Advent Calendar; a real piece of art. Did you create all the designs yourself or were they stencils? Hope you had a wonderful holiday season and will have a wonderful 2014. I’m looking forward to your future posts. No, they weren’t stencils. In the case of the birds, star, and numbers/letters, I hand-sketched them before painting. Normally this would be a bad technique for acrylic, but since I normally work in gouache, I found it more intuitive to do it that way. 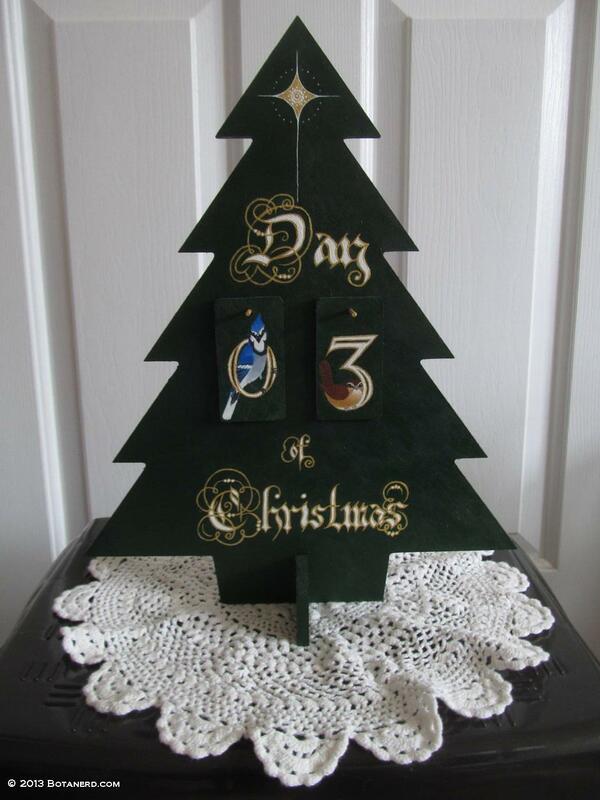 This is such a beautiful advent calendar! You need to get this patented because I want one! :0) You are such an inspiration! The whole idea is so wonderful. Love the design and the paintings, both. BEAUTIFUL. It is copyrighted; I don’t think I’ll produce them for sale, though! It took a lot of time and effort. Maybe I’ll make prints? If I do end up doing something like that, though, I’ll post about it! It runs in the family! I was so excited to view your artwork after being provided a link. You have exceptional skills that should be developed much further. One of your distant cousins in Australia is also an artist. But botany!! Now that is following in your forefather’s footsteps. They developed apothecary style natural remedies that were used to treat kings. I hope to publish their remedies one day – maybe next year! Excellent work Botanerd. Thank you! I didn’t know that my ancestors on that side had such an illustrious medical background I would of course be interested to read that work whenever it’s ready. That would make a great post!